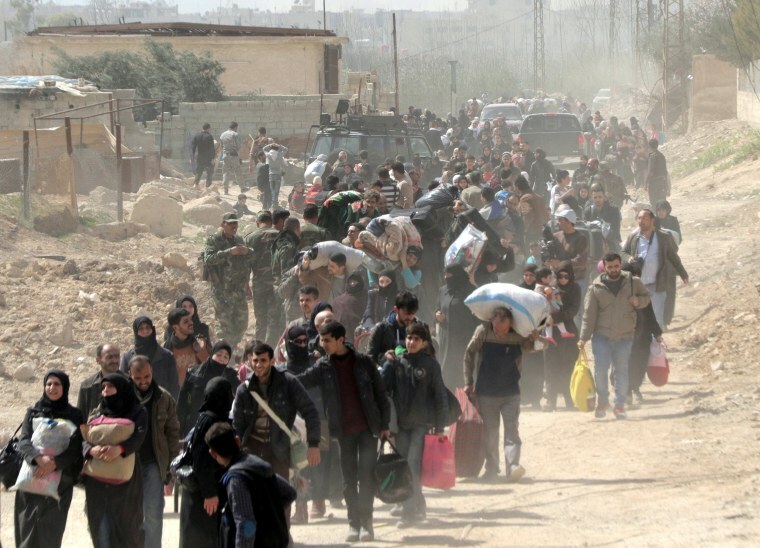 An estimated 42,000 civilians fled bombings Thursday from the Syrian military near Damascus and Turkish troops in the country's north. 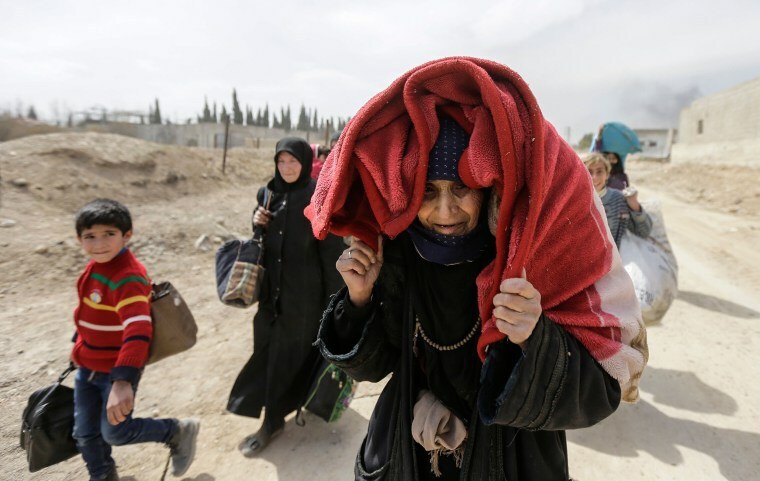 Men, women and children walk along a dirt road to army lines in Eastern Ghouta on March 15. 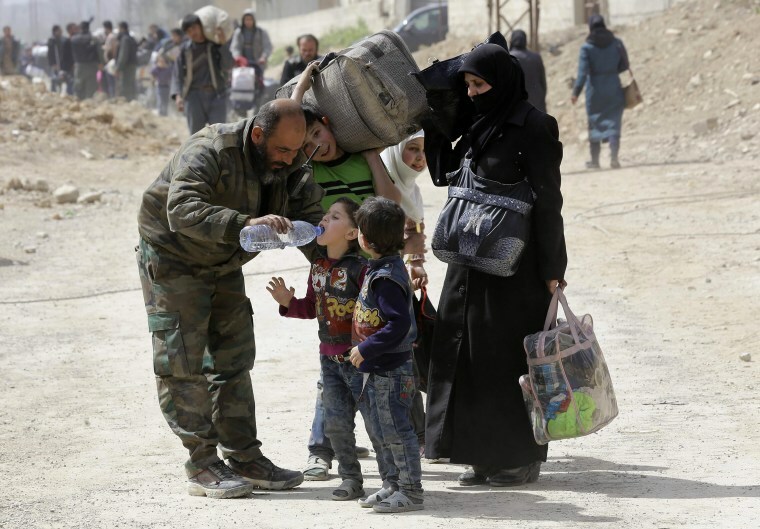 It was the largest single-day exodus of civilians from fighting in Syria's civil war and a reminder of how the conflict that sparked the world's worst humanitarian catastrophe continues to hit new lows as it enters its eighth year. 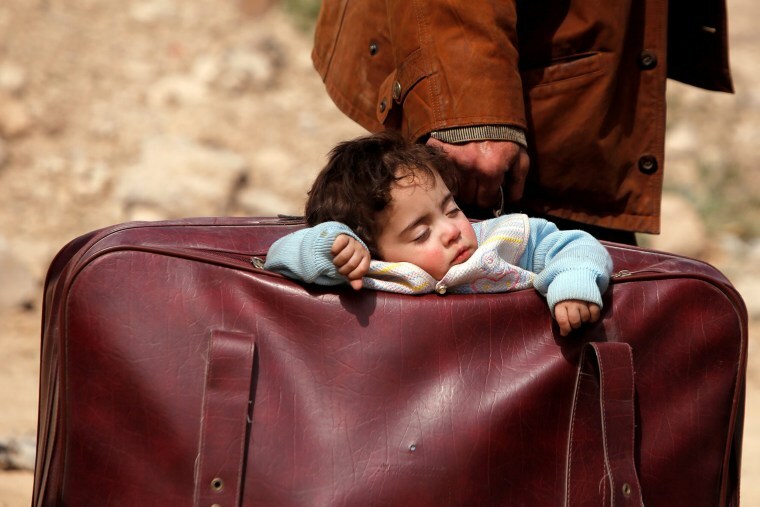 A man carries a sleeping child in a suitcase in the village of Beit Sawa, eastern Ghouta. People carry their belongings as they flee from Hamouria. 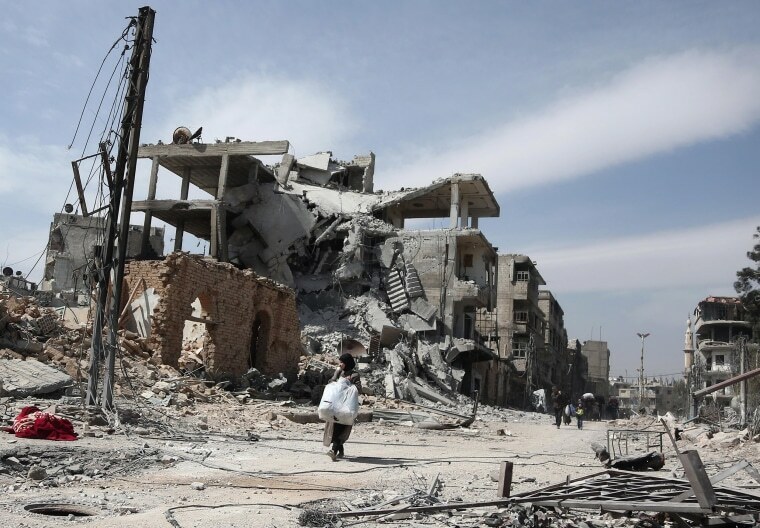 Starting Wednesday night, intense shelling and aerial strikes paved the way for a ground advance on Hamouria, a town in the region's isolated southern pocket. It also triggered a mass exodus, unexpected in scale. 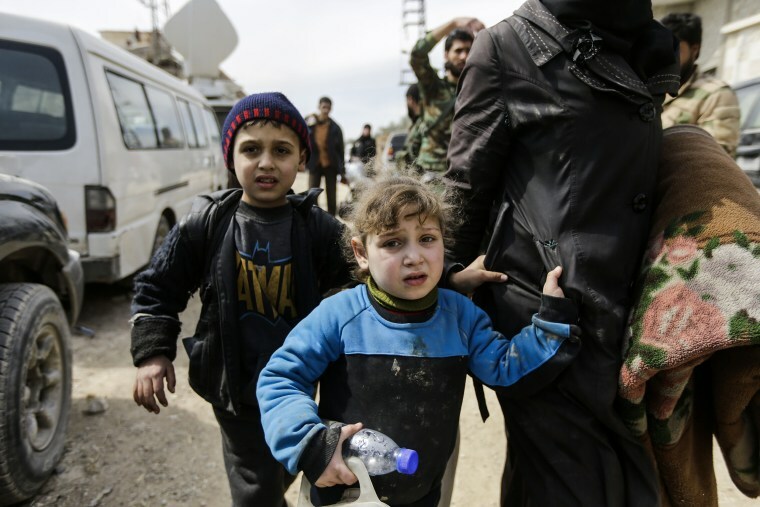 Children hold on to a woman's coat as they walk through the regime-controlled corridor opened by government forces in Hawsh al-Ashaari, east of Hamouria. Since mid-February, Syrian troops have targeted the capital's sprawling eastern Ghouta region with shells, airstrikes and, at times, even toxic gas, according to opposition medics. They are now in control of the majority of the enclave that had been in rebel hands since 2012. 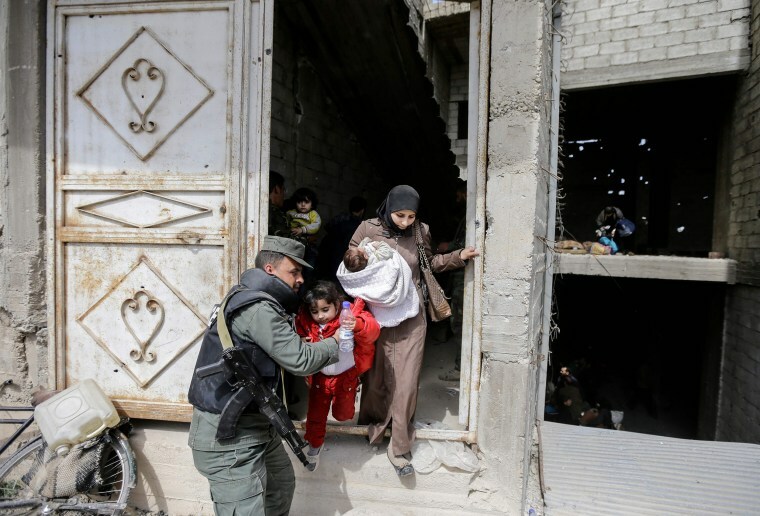 A Syrian government policeman helps a child out of a building as civilians flee from the Eastern Ghouta enclave during an evacuation through the regime-controlled corridor in Hawsh al-Ashaari, east of the enclave town of Hamouria. 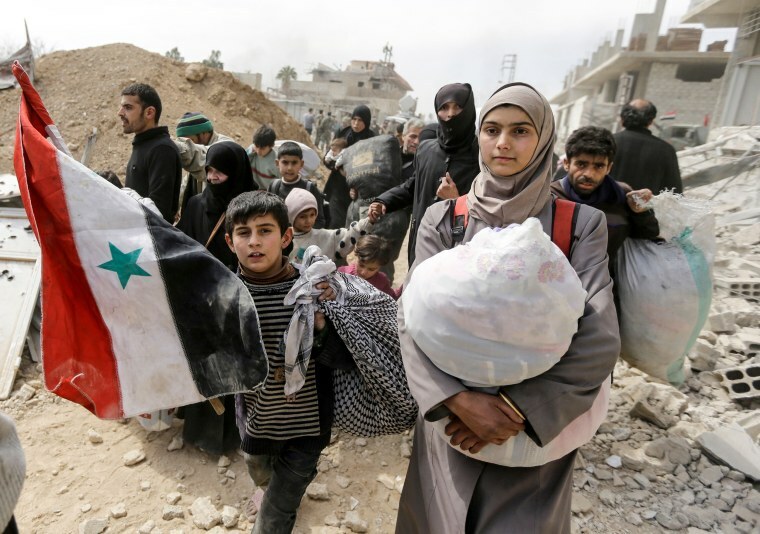 A child holds a Syrian flag as civilians pass through the regime-controlled corridor opened by government forces in Hawsh al-Ashaari, east of the enclave town of Hamouria. A member of the Syrian government forces helps children drink from a water bottle during the evacuation. 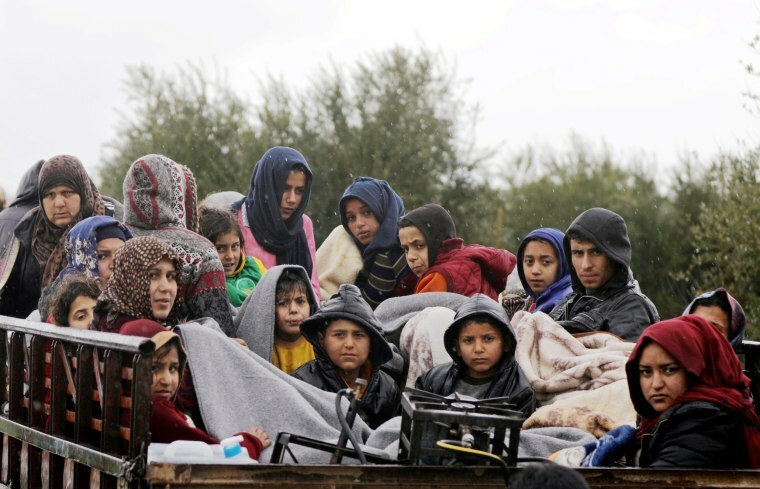 At least 10,000 men, women and children emerged from Hamouria and nearby opposition towns, carrying their possessions. 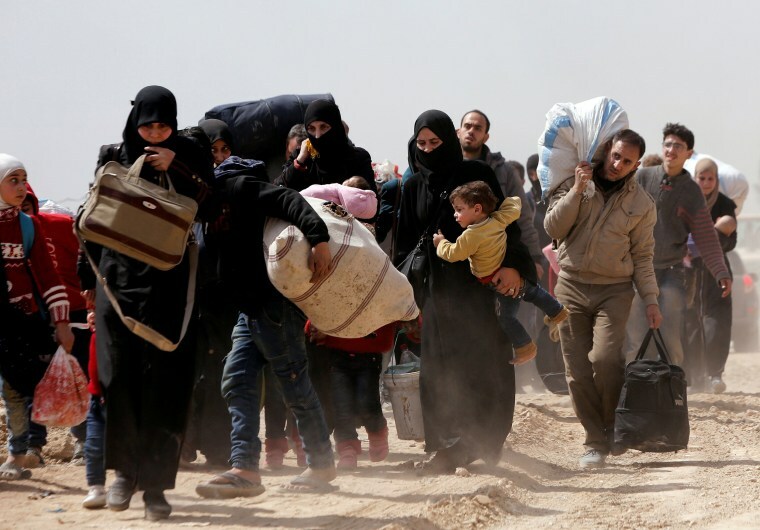 Thursday's civilian exodus underscored the intractability of a conflict that has invited world powers to stake out their spheres of influence in the fragmented country. 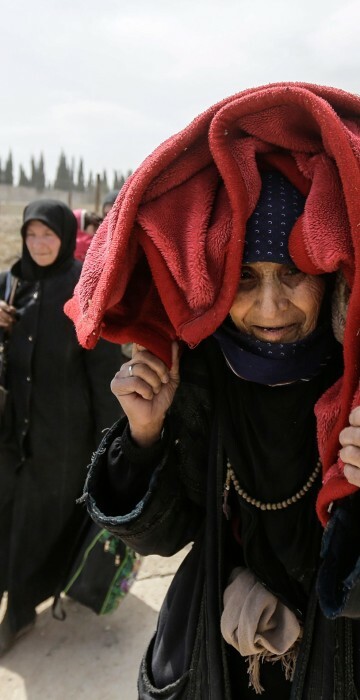 To the north, tens of thousands fled the Turkish military offensive on the Syrian Kurdish-controlled enclave of Afrin. Turkey considers the Kurdish militia a threat to its national security. People carry their belongings as they flee the rebel-held town of Hamouria. 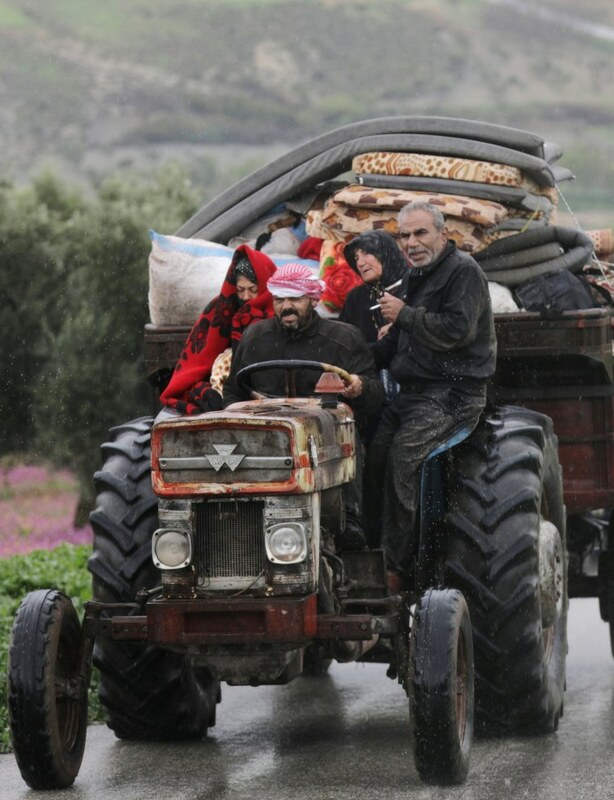 People use a farm tractor to flee Afrin. 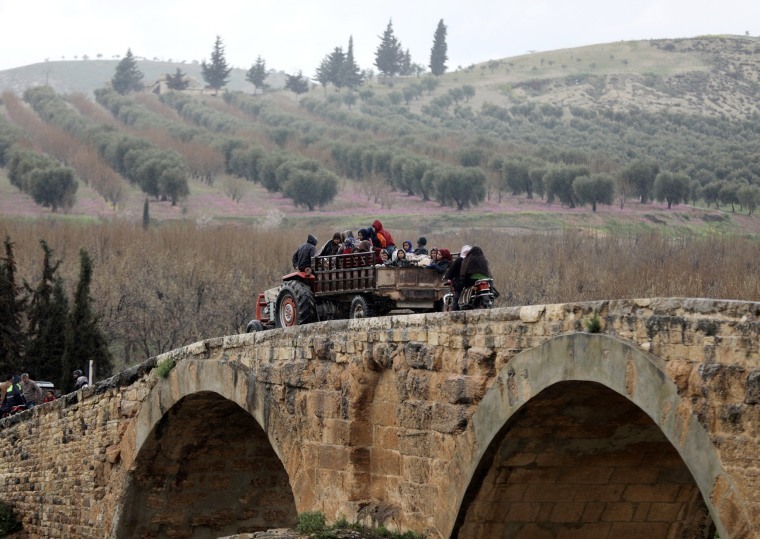 People sit in a truck with their belongings in the northeast of Afrin. 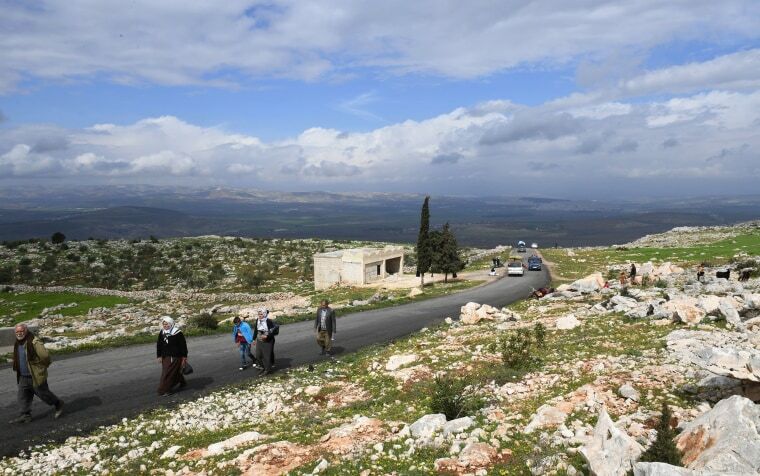 Civilians fleeing the Turkish military offensive in Afrin walk on a mountainous road in al-Ahlam. They were headed to Nubol, northwest of Aleppo.